A year ago I told my coworker that I had just signed up for a half marathon, at the time he had said soon you will be signing up for a marathon. At that time I said “No way! 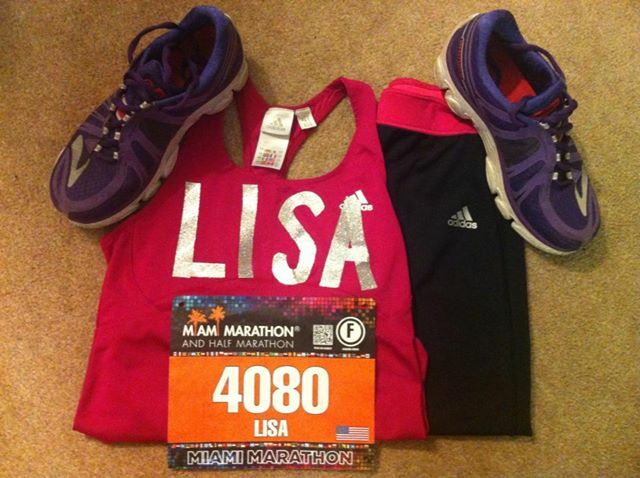 A marathon is way too much for me” actually believing that I could not do a full marathon. When I signed up for this race I had just finished the Tropical 5k, which is the 5k the day before the big race. There was a race blitz and I decided to sign up for the half marathon distance since it was 20% off by the time I got a chance to sign up. 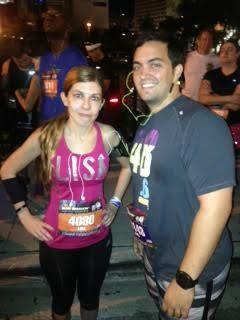 At the time I hadn’t even ran my first half marathon, yet was planning for a year in advance to run another one, the Allstate 13.1 Miami Beach was still a month away. Fast forward to June, when I finally was cleared to start running again after my surgery I decided then that if I could survive such a big scare then I could run a full marathon. I started training a bit early in September since I was not sure how the holidays would go and effect my long runs. It is a good thing I did since lots of things came up the last few months of the year: a friend’s wedding & all the events that come with weddings, baby shower, unexpected races and travel. Since the Fall here is generally (not this year) slightly cooler than the rest of the year there are tons of races and I had to sign up for a lot of them I had to alter my long runs at times. For the most part I got in most of my long runs and two 20+ milers during training luckily still. sparkle duct tape lettering, got the idea from Fannetasticfood.com. Amazingly stayed on through sweat & rain! When race day started to approach and I started to taper a bit it was a very strange feeling, since I hadn’t tapered for any races since March. I will admit I might have been a bit more agitated by things around me also at the time. Otherwise I was feeling very confident in my training and the goal was to just finish the race feeling good. I’m proud to say I accomplished that goal and was able to make my final mile the fastest in my splits. Waiting with Matt in Corral F.
Race day morning I got up early, I’d say 3:30am and got ready to leave for the race, packing a small bag of things I might need. I got a ride with my aunt, who was doing the half marathon that day, she kept being negative about how she was probably going to get a call from a race official to pick me up from the road. Those kind of comments do not get me down, instead they just make me more determined to prove them wrong. I dropped my bag off at my aunt’s Galloway group tent and headed to the AAA to use the bathroom. When there’s a real bathroom I will take it any day over a smelly port a potty and luckily I got there just in time for them to open up another ladies bathroom. Then I headed to find the F corral where I would wait till the race started, it was a bit confusing to navigate especially with sooooo many people waiting around. Eventually I found it and sat down on the curb to wait, I find resting my legs as much as possible before the race begins helps me conserve more energy. I’ve never been one to stretch and hop around before a race and it’s always worked for me. My friend Matt met up with me in the corral and we started out the race together. I did not want to start out too fast so he kept me slow for the first couple of miles till he dropped off at the first water spot to stretch out his legs. 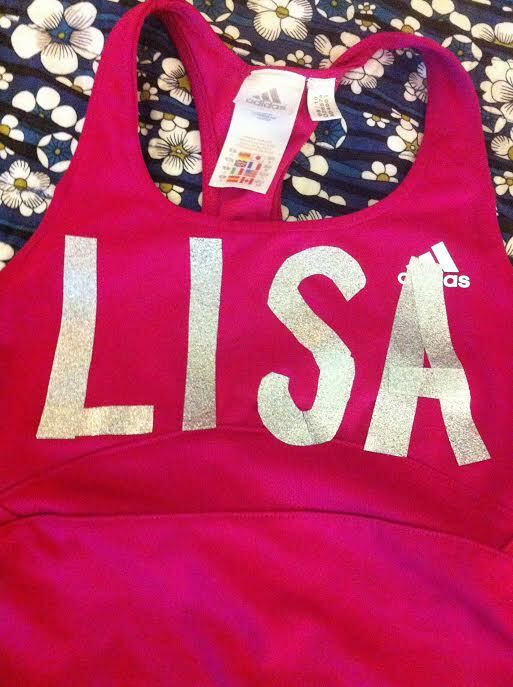 I never really understood why people put their names so big on their shirts for races till I did the same, at first it was a bit weird having strangers scream “GO LISA” but eventually it really really helped me. I liked all the crowd support right over the Venetian Causeway, a giant mob of cheering faces. I stopped at a few water stops in the first half but all the water stops in the 2nd portion, by then it was getting very very warm. Even when the race started at 6:30am it was already close to 80 degrees so I knew I had to stay as hydrated as possible. Basically the first 12 miles were super crowded since 75% of the people were signed up for the half marathon distance. Just around the time of the split I saw a couple people start to walk, I started cheering and telling them to get going and finish the half strongly. By the time we split off it was desolate and only a couple runners ahead and a couple behind but pretty quiet. Less cheering squads except at the water stops, usually there were cheerleaders there which were helpful and cheered for me by name. I have to say the Coconut Grove residents who were out in their front yards cheering and giving everyone water/snacks were awesome! At around mile 16 in Coconut Grove the skies started getting dark and when the wind picked up I knew we were about to get some rain. Quickly I pulled out my phone to put it in a plastic baggie so it wouldn’t get soaked and my grandma was calling. I picked up and told her I had 10 more miles to go and had to get off the phone because rain was coming. Five minutes after I hung up with her it started pouring, so for the next 5 miles I ran through the rain. 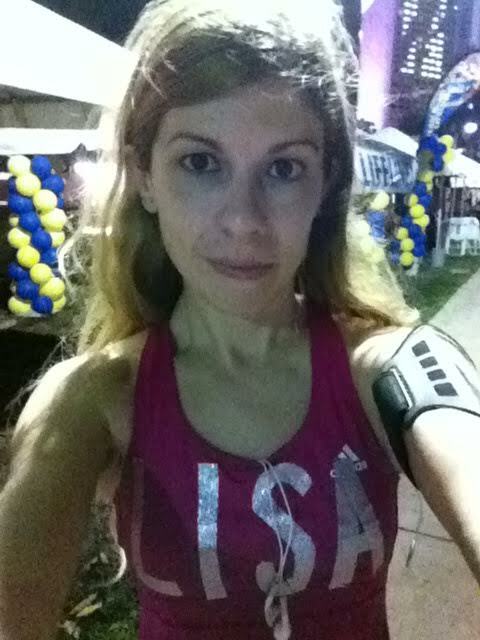 Ran by an awesome resident giving out ice cold beer just before the Rickenbacker Causeway but didn’t partake in any. I just wanted to keep up the momentum because I knew if I would slow down for too long I would get lazy and walk too much. That was the hottest part of the race, there is no shade out there with Biscayne Bay beside you. Back in Brickell I passed lots of brunch’ers who cheered me on drunkenly while stumbling down the sidewalk, that was pretty amusing. 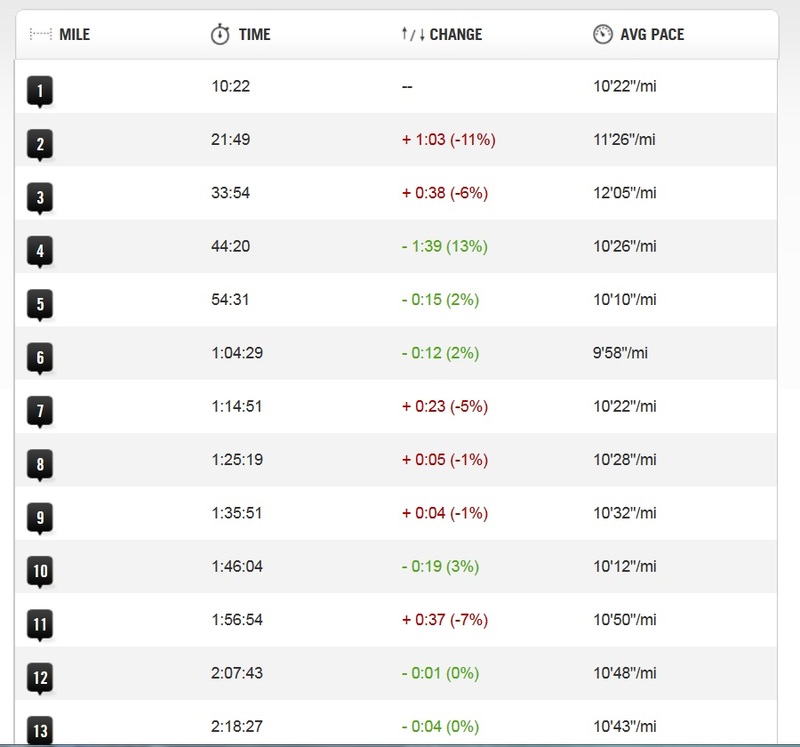 I was so happy to see that mile 25 sign that I increased my speed and it ended up being my fastest mile of the whole marathon! But that last mile did seem the longest with a steep bridge just before the final .40 , I trudged over it and once I turned the corner and saw that finish line arch I sprinted to it. 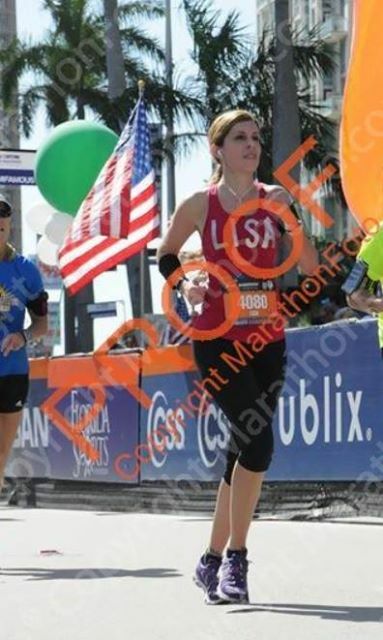 Never had I felt so accomplished after crossing that finish line. I got my medal and put a Nuun tablet in my water immediately and grabbed a banana from the food tent. Then met up with my aunt and her running friends at the Galloway tent to rest, I knew I had to keep moving for a bit longer so that I wouldn’t get really stiff afterwards. By that time the side of my knee was aching and I was kind of hobbling around, my IT band. Never have I had a problem with it before, but probably going those 26 miles for the first time aggravated it. When I got home later that day I made sure to ice it and put my Zensahs on, seemed to help. 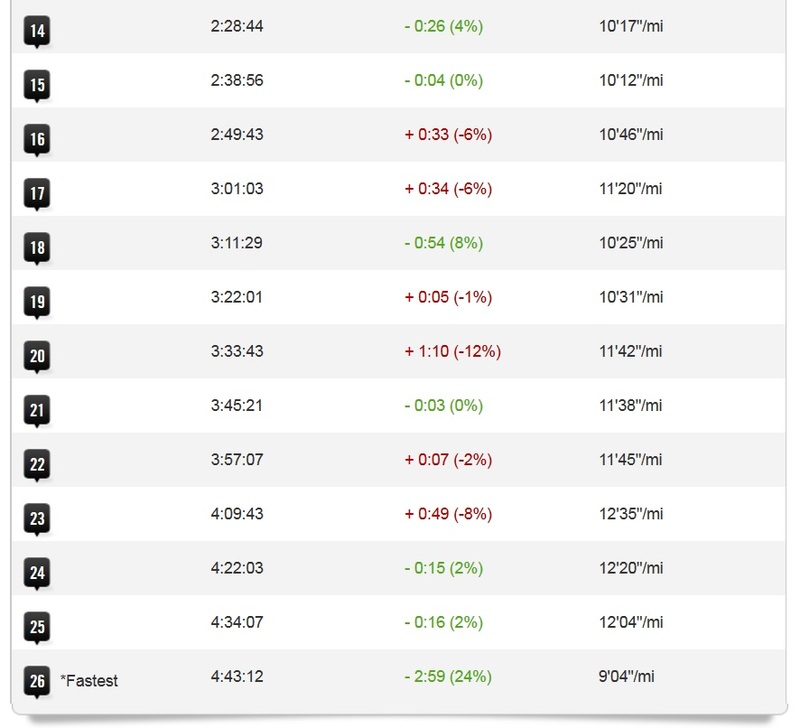 For the next few days my quads and hamstrings were achy but nothing crazy, so I rested and did not run for 3 days after. Almost to the finish line!! Got my trusty Zensahs on & still got all my toenails! Overall I felt that this marathon experience was a great one. I didn’t worry about my finishing time, this race’s goal was just about finishing and feeling good still. I succeeded and signed up for next year’s marathon again. Can’t wait! Great recap. 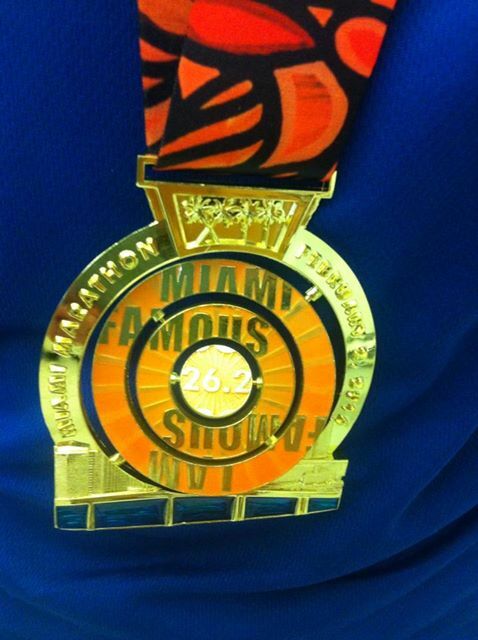 This race has been on my list for a while ( Born & raised in the 305). I’m torn between this and ft lauderdale for a full next year.